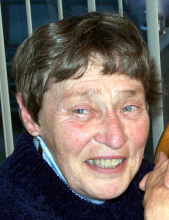 Her Legacy…Judith L. Heslip, age 79, passed away, February 7, 2019, surrounded by her loving family. Judy was born in Detroit, MI on November 11, 1939 to Fred (John) and Esther (Seeley) White. She married the love of her life, William Heslip, January 28, 1961 in Northville, MI. Judy loved her dogs, enjoyed being outdoors, fishing, snowmobiling, and horseback riding just to name a few. She also enjoyed spending many years with her family at their home in the UP. Judy will be remembered as a loving wife, mother, grandmother and great grandmother, and sister. Her Family…Judy is survived by her children, John (Janene) Heslip, Janet (Charlie) Berry, Bill (Amy) Heslip and Larry (Karen) Heslip; 9 grandchildren and 7 great grandchildren; and 2 brothers, Robert and Walter. She is preceded in death by her husband, William and her parents. To send flowers or a remembrance gift to the family of Judith L. Heslip, please visit our Tribute Store. "Email Address" would like to share the life celebration of Judith L. Heslip. Click on the "link" to go to share a favorite memory or leave a condolence message for the family.